The audio requirements of a live setup are many and varied and typically include mic, line and instrument sources, alongside monitoring, auxiliary and headphone outputs. But whether your setup is simple or complex you’re going to need a mixer. 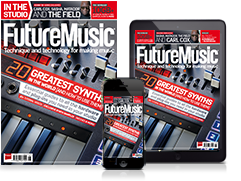 Here we take a look at a broad array of units both analogue and digital. Some of these don’t go beyond simply combining a few signals, while others provide integrated multitrack recording, USB DAW interfacing and Wi-Fi based remote control. That’s a pretty wide remit, and even more so when you consider some follow a traditional desk layout, while others opt for the increasingly popular rack mount plus remote design. Whatever the features make no mistake these mixers are the best of the best from market leading manufacturers. What’s more in many cases our review units come in a few different sizes, so you’ll likely find one that fits your particular I/O needs. For a truly pocket sized solution this compact 4 in 2 out mixer combines two 1/4” instrument impedance inputs (numbered 3 and 4) with a mini jack stereo input (2) and rather unusually a phantom powered XLR mic input (1). Gain is set using 4 small rotary controls and the output is via two unbalanced 1/4” jacks with overall unit power coming from an 18V external PSU. Phantom power is in an ‘always on’ state, which isn’t ideal but should be fine for most modern condenser and dynamic mics. The MX4 is very much a case of what you see is what you get, but if you’re simply trying to combine the particular analogue inputs it handles and don’t want interfacing or processing, it’s a very affordable option. Soundcraft’s Notepad-5 is a simple ultra compact desk and the smallest in their Notepad range. Its 5 inputs are arranged as one mono mic/line/instrument channel and two stereo channels (one line level with 1/4” jack inputs and one line level with phono inputs). The mono input features a quality Soundcraft preamp alongside basic 2-band EQ, low cut filter, Hi-Z switch and peak level meter. Each channel also includes a dedicated monitor level. This feeds a single jack output with level control that can be switched between stereo for headphone use and mono for stage monitor use. The main outputs include 2-channel LED metering and level knob, and outputs are on XLR, with a USB connector providing two track input to DAW. Notepad-5 is basic but well made and offers great value for money. Mackie's latest live mixer range, the Mix Series, is unashamedly affordable and primarily aimed at those situations where a convenient, low profile mixer is needed to blend together a few signals. You get 4 mic/line channel strips all with three-band EQ and 75Hz low cut filter, plus 8 further EQ-free stereo channels. There’s one mono post fader auxiliary send per channel strip (FX) hard-wired to the onboard FX processor - this has 12 ‘as is’ effects and a dedicated stereo return. You also get independent Control Room and Phones outputs with shared level and 60mm channel and Main Mix faders, providing both visual and tactile feedback. With the Mackie stamp of quality, it should deliver reliable service for a number of years. Zoom’s LiveTrak L-12 is a compact digital desk that can blend 8 mono mic/line inputs (inputs 1 and 2 are also Hi-Z instrument compatible) and 2 stereo signals, adding EQ, effects and dynamics. 5 separate powered headphone outputs keep multiple performers happy while onboard SD recording at up to 24 bit 96kHz and integrated metronome also make it a self-contained recording solution. Channels have plenty of physical controls, with EQ and panning accessed by a centralized Channel Strip panel. There’s also one hardwired FX bus with 16 editable effects. Audio interface mode turns the L-12 into a 14 in / 4 out USB interface although here maximum sampling rate is 48kHz. Overall the L-12 is fantastic compact and feature rich digital desk. The largest desk from Alto’s traditional analogue Live range gives you 24 inputs (16 mono and 4 stereo) including 18 of their DNA mic preamps, plus 4 group outputs and main output. Each channel includes 3 band EQ, 4 auxiliaries (the first two can be pre/post fader) and the first 8 channels also get single knob compression. There are also 100 onboard effects courtesy of Alesis and an integrated Graphic EQ on main output. One fader per channel familiarity makes it a cinch to use and stereo USB connectivity means you can interface a stereo mix directly too and from your DAW. Much like the smallest 802 mixer (review link below), the Live 2404 is feature packed and excellent value. Behringer’s XR18 is a super compact and sturdy rack based digital mixer. It has 18 inputs (16 mic/line, two line), eight outputs (main L/R and six auxes) and one headphone output. Mic preamps are quality Midas designs and inputs 1 and 2 also get high impedance support. Control connectivity is via onboard wi-fi or wired ethernet, and USB 2.0 provides 18 channels of DAW I/O. Behringer’s Ultranet protocol output can carry 16 digital sources for onward use in Behringer’s P16 Personal Mixers or Turbosound’s iQ PA systems. Onboard processing including EQ, dynamics, routing and effects (there are four multi-effects modules) are handled remotely via the cross-platform X AIR Edit software (PC, Mac, Linux, Raspberry Pi, iOS and Android). Meanwhile the Meter page provides a quick overview of signal activity. It’s a serious feature set for the money and very easy to set up/use. With both Wi-fi remote and front panel operation, this 16 input 16 bus mid priced digital desk is ideal for small live and performance setups. You get 12 mic inputs, the first 4 of which use combi connectors. You also get two further stereo input pairs on 4 TRS jacks, with one pair also on mini jack format. On the output side 6 assignable outputs join the stereo main and monitor outputs, with a single headphone on the top panel. Processing parameters and routing are handled via the 7” touch screen, however you’ve also got physical input gain knobs, input metering and 9 motorised 100mm faders (8 channel and 1 master) which means the desk retains some traditional feel. Onboard SHARC based DSP powers 8 effects processors and although there’s no multichannel USB DAW interfacing, a USB drive can be connected to save settings and record the stereo output. Qu-SB is a portable rackmount digital mixer with 18 inputs (16 mic/line, two line), 14 outputs (12 XLR, two TRS) and one headphone output. Allen & Heath’s dSnake equipped AudioRacks can extend the connectivity further (potentially 38 ins, 24 outs) and it’s compatible with their ME Personal Mixing System. Mixer control is app based via iPad only (you’ll need to hook up your own wi-fi router). The main mixer app (Qu-Pad) is joined by apps for musician monitoring (Qu-You) and levels only (Qu-Control). Onboard processing includes EQ, dynamics and ducking on all inputs, and EQ and dynamics across all outputs. Meanwhile four dedicated FX busses access four independent FX engines. Qu-SB supports 32 channels of DAW I/O via USB 2.0, but also includes onboard multi-track recording to USB stick, supporting up to 18 tracks at 48kHz 24-bit. All told the Qu-SB is an excellent and scalable device, with some great options and impressive iOS apps. 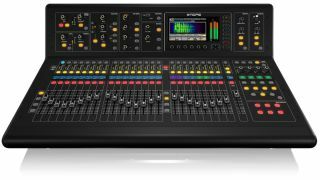 The largest of QSC’s Touchmix series (there’s an 8 and 16 channel version too) kicks it out of the park with 24 mic inputs, 16 outputs, 8 sub groups and 32 mixing channels all in a compact standard digital desk format. On board processing includes 4-band EQ and dynamics on all input channels, 6-band EQ and limiter on all outputs, six multi-effects engines and ‘wizard’ style processors for anti feedback and room tuning. Most settings including faders are handled via the integrated 10” touchscreen and remote control is also possible using the TouchMix app for iOS and Android. 32 channel direct to drive recording is available via the onboard USB, as is 32 channel DAW I/O. All told the TouchMix 30 delivers a lot of mixer for your money. Midas know a thing or two about live mixing desks, much of which is crammed into this awesome yet compact digital desk. With 32 award winning Midas preamps, 25 100mm motorised faders, LCD scribble strip, integrated talkback and per channel level and dynamics metering the M32 delivers traditional desk style features. However, these are coupled with global physical encoders and buttons for channel strip settings (EQ, dynamics and auxiliaries) that combine with the 7” TFT screen, 8 onboard effects slots, snapshots, and cross platform wireless remote control to deliver impressive digital flexibility as well. Throw in plenty of physical connectivity, flexible routing and an expansion card slot that can house various I/O modules (USB, MADI, ADAT and Dante) and you’ve got professional level options as well. It’s not cheap but the impressive feature more than justifies the price.